It starts light-heartedly enough. Take your basic haunted house story, only do it with dogs investigating a haunted doghouse. And slowly, gradually, the stories get darker. Burden Hill would appear to be your everyday, quiet suburb, except... things... are starting to happen, and while the local humans haven't noticed anything yet, the local dogs certainly have. 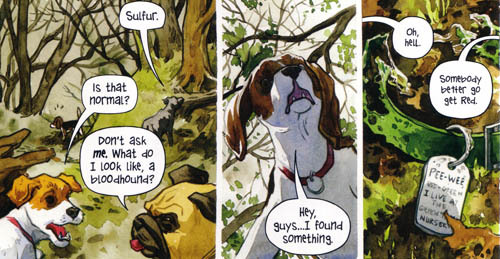 Beasts of Burden is basically a series of comic books about canine paranormal investigation. (Plus a couple of cats.) 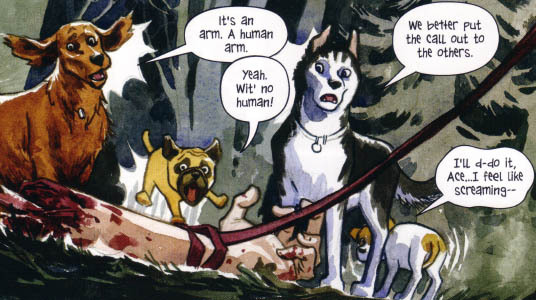 The writing by Evan Dorkin manages to be fun and ominous at the same time, and he gives the dogs distinct personalities in a way that feels very believable. The artwork by Jill Thompson is rendered in excellent watercolors, and generates just the right atmosphere. 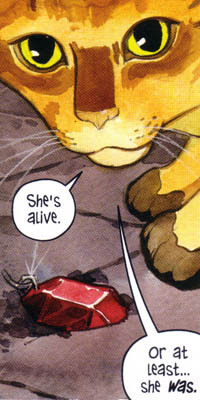 Working together, the series has won them five Eisner Awards so far. If you haven't heard of it, it's probably because it shows up very sporadically in anthologies and other comics published by Dark Horse. 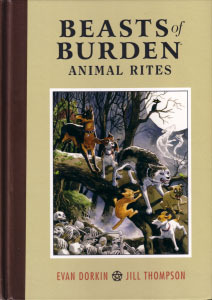 From 2003-2009 there were four short stories and four comics, which were collected together in 2010 as Beasts of Burden: Animal Rites (ISBN 9781595825131). In 2011, there was a crossover issue with Hellboy called Sacrifice. In 2011-2012 there were three more short stories, which have since been collected together in a single comic called Neighborhood Watch. Plot-wise, most of the stories are stand-alone and fairly short, so I don't want to go into details. If you're not a horror fan, don't worry, I'm not either, and I was never outside my comfort level. Sure, there's the occasional corpse or body part, zombies, black magic, the glowing eyes of the possessed... er, well, trust me here. Even with the occasional bit of blood, the artwork never goes for the gross-out factor, preferring to be dark and chilling when necessary. There's a larger background story that's been building up. The dogs know they have a duty to fight the evil manifesting in their neighborhood, only they don't know the source, and they're in way over their heads. Luckily they've been receiving help from the "Wise Dog Society", a mysterious group of dogs who have begun to teach them about mystical phenomena, including rudimentary magic. And while it's one thing to learn about the paranormal, they miss the innocence of their lives before it all started. Knowing that their troubles are only beginning, it's not clear when the next stories in this series will appear. However, there's been recent news that a CGI animated film might be in the works from Reel FX Creative Studios, to be written by Darren Lemke and directed by Shane Acker, probably using the characters and settings from the comic, but not adapting any of the current stories. I can't say anything negative about this comic. It's been very enjoyable from what I've seen so far, and some parts have even managed to give me a shiver, which is the whole point. 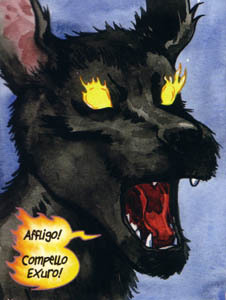 So if you like that sort of thing and want to check it out, I'd recommend tracking down Beasts of Burden: Animal Rites. It's got eight stories and it's over 150 pages, which makes for a good long read. Plus it's hardcover, so if you can't find it in bookstores, it's very likely to be in libraries. Give it a try! P.S. : Note to self, Never summon Sekhmet. That's "Animal Rites", not "Rights".